Johann Wolfgang Von Goethe was a famous Writer from Germany, who lived between August 28, 1749 and March 22, 1832. He became 82 years old. Goethe was born in Frankfurt am Main. His father, Johann Caspar Goethe, was a prominent and wealthy lawyer, who personally supervised his son's early education. 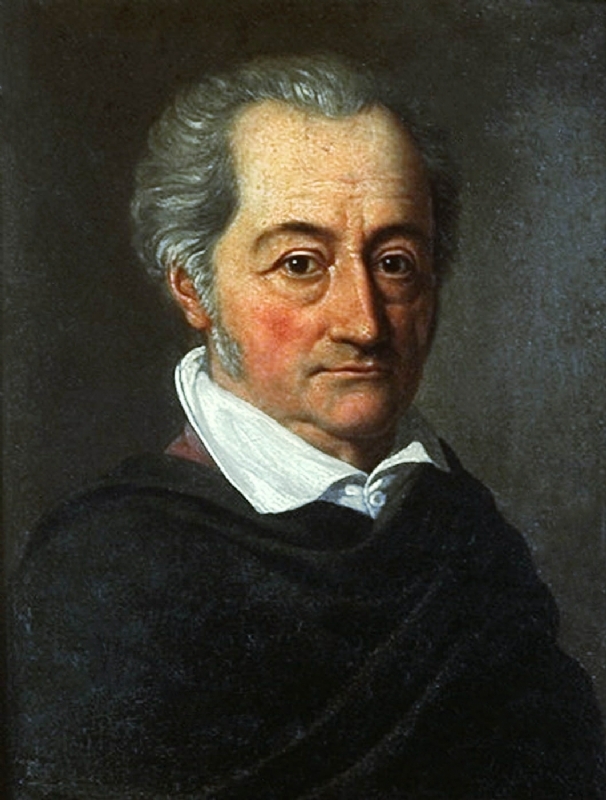 The young Goethe studied at the universities of Leipzig and Strasbourg, and began practicing as a lawyer in 1772 in Wetzlar. At the invitation of Karl August, Duke of Saxe-Weimar, he moved to Weimar in 1775, where he held several political offices and was Duke's top adviser. From 1786 to 1788 he traveled in Italy, and was head of the Duke all the theater in Weimar. He participated in the war against France and started a friendship with Friedrich Schiller, which lasted until his death in 1805. In 1806 he married Christiane Vulpius. From about 1794 he devoted himself mainly to literature, and after a very long and productive life, he died in Weimar. He is born under the zodiac virgo, who is known for Analyzing, Practical, Reflective, Observation, Thoughtful. Our collection contains 156 quotes who is written / told by Johann, under the main topics: Happiness, Art, Beauty, Intelligence, Leadership. "Love does not dominate; it cultivates"
"One must ask children and birds how cherries and strawberries taste"
"Thinking is easy, acting is difficult, and to put one's thoughts into action is the most difficult thing in the world"
"This is the highest wisdom that I own; freedom and life are earned by those alone who conquer them each day anew"
"Those who hope for no other life are dead even for this"
"To appreciate the noble is a gain which can never be torn from us"
"To create something you must be something"
"To hard necessity ones will and fancy must conform"
"We cannot fashion our children after our desires, we must have them and love them as God has given them to us"
"We don't get to know people when they come to us; we must go to them to find out what they are like"
"We know accurately only when we know little, with knowledge doubt increases"
"We usually lose today, because there has been a yesterday, and tomorrow is coming"
"We will burn that bridge when we come to it"
"What by a straight path cannot be reached by crooked ways is never won"
"What is important in life is life, and not the result of life"
"What is my life if I am no longer useful to others"
"What is not started today is never finished tomorrow"
"What is uttered from the heart alone, Will win the hearts of others to your own"
"Behavior is the mirror in which everyone shows their image"
"Being brilliant is no great feat if you respect nothing"
"Certain defects are necessary for the existence of individuality"
"Character is formed in the stormy billows of the world"
"Character, in great and little things, means carrying through what you feel able to do"
"Common sense is the genius of humanity"
"Correction does much, but encouragement does more"
"Daring ideas are like chessmen moved forward; they may be beaten, but they may start a winning game"
"Death is a commingling of eternity with time; in the death of a good man, eternity is seen looking through time"
"Every person above the ordinary has a certain mission that they are called to fulfill"
"Every spoken word arouses our self-will"
"Every step of life shows much caution is required"
"Everybody wants to be somebody; nobody wants to grow"
"Everything in the world may be endured except continual prosperity"
"Few people have the imagination for reality"
"First and last, what is demanded of genius is love of truth"
"A clever man commits no minor blunders"
"A correct answer is like an affectionate kiss"
"A creation of importance can only be produced when its author isolates himself, it is a child of solitude"
"A man's manners are a mirror in which he shows his portrait"
"A noble person attracts noble people, and knows how to hold on to them"
"A person hears only what they understand"
"A person places themselves on a level with the ones they praise"
"A really great talent finds its happiness in execution"
"A useless life is an early death"
"Age merely shows what children we remain"
"All intelligent thoughts have already been thought; what is necessary is only to try to think them again"
"All the knowledge I possess everyone else can acquire, but my heart is all my own"
"All theory, dear friend, is gray, but the golden tree of life springs ever green"
"All things are only transitory"
"An unused life is an early death"
"As soon as you trust yourself, you will know how to live"
"Be above it! Make the world serve your purpose, but do not serve it"
"Be generous with kindly words, especially about those who are absent"
"Beauty is a manifestation of secret natural laws, which otherwise would have been hidden from us forever"
"Beauty is everywhere a welcome guest"
"Only by joy and sorrow does a person know anything about themselves and their destiny. They learn what to do and what to avoid"
"Passions are vices or virtues to their highest powers"
"Personality is everything in art and poetry"
"Piety is not a goal but a means to attain through the purest peace of mind the highest culture"
"Plunge boldly into the thick of life, and seize it where you will, it is always interesting"
"Science arose from poetry... when times change the two can meet again on a higher level as friends"
"The credit of advancing science has always been due to individuals and never to the age"
"The decline of literature indicates the decline of a nation"
"The deed is everything, the glory is naught"
"The formation of one's character ought to be everyone's chief aim"
"The hardest thing to see is what is in front of your eyes"
"The human mind will not be confined to any limits"
"The intelligent man finds almost everything ridiculous, the sensible man hardly anything"
"The little man is still a man"
"The man who occupies the first place seldom plays the principal part"
"There is nothing in which people more betray their character than in what they laugh at"
"There is nothing insignificant in the world. It all depends on the point of view"
"There is nothing so terrible as activity without insight"
"For a man to achieve all that is demanded of him he must regard himself as greater than he is"
"For just when ideas fail, a word comes in to save the situation"
"Fresh activity is the only means of overcoming adversity"
"He who enjoys doing and enjoys what he has done is happy"
"He who has a task to perform must know how to take sides, or he is quite unworthy of it"
"He who possesses art and science has religion; he who does not possess them, needs religion"
"I call architecture frozen music"
"I can tell you, honest friend, what to believe: believe life; it teaches better that book or orator"
"I do not know myself, and God forbid that I should"
"I love those who yearn for the impossible"
"I never knew a more presumptuous person than myself. The fact that I say that shows that what I say is true"
"I think that I am better than the people who are trying to reform me"
"I will listen to anyone's convictions, but pray keep your doubts to yourself"
"Ignorant men raise questions that wise men answered a thousand years ago"
"In art the best is good enough"
"In nature we never see anything isolated, but everything in connection with something else which is before it, beside it, under it and over it"
"In the realm of ideas everything depends on enthusiasm... in the real world all rests on perseverance"
"It is after all the greatest art to limit and isolate oneself"
"It is better to be deceived by one's friends than to deceive them"
"It is in self-limitation that a master first shows himself"
"It is not doing the thing we like to do, but liking the thing we have to do, that makes life blessed"
"It is the strange fate of man, that even in the greatest of evils the fear of the worst continues to haunt him"
"It seems to never occur to fools that merit and good fortune are closely united"
"Dream no small dreams for they have no power to move the hearts of men"
"Girls we love for what they are; young men for what they promise to be"
"Nothing shows a man's character more than what he laughs at"
"Objects in pictures should so be arranged as by their very position to tell their own story"
"The world remains ever the same"
"Whoever wishes to keep a secret must hide the fact that he possesses one"
"He is dead in this world who has no belief in another"
"When ideas fail, words come in very handy"
"Who is the wisest man? He who neither knows or wishes for anything else than what happens"
"Deeply earnest and thoughtful people stand on shaky footing with the public"
"Devote each day to the object then in time and every evening will find something done"
"Hatred is active, and envy passive dislike; there is but one step from envy to hate"
"If a man or woman is born ten years sooner or later, their whole aspect and performance shall be different"
"If children grew up according to early indications, we should have nothing but geniuses"
"The biggest problem with every art is by the use of appearance to create a loftier reality"
"The most happy man is he who knows how to bring into relation the end and beginning of his life"
"Every author in some way portrays himself in his works, even if it be against his will"
"Knowing is not enough; we must apply. Willing is not enough; we must do"
"The Christian religion, though scattered and abroad will in the end gather itself together at the foot of the cross"
"Who is the most sensible person? The one who finds what is to their own advantage in all that happens to them"
"Destiny grants us our wishes, but in its own way, in order to give us something beyond our wishes"
"Hatred is something peculiar. You will always find it strongest and most violent where there is the lowest degree of culture"
"If you modestly enjoy your fame you are not unworthy to rank with the holy"
"If you wish to know the mind of a man, listen to his words"
"Upon the creatures we have made, we are, ourselves, at last, dependent"
"He is happiest, be he king or peasant, who finds peace in his home"
"Life is the childhood of our immortality"
"The person born with a talent they are meant to use will find their greatest happiness in using it"
"If I love you, what business is it of yours?" "To witness two lovers is a spectacle for the gods"
"Do not give in too much to feelings. A overly sensitive heart is an unhappy possession on this shaky earth"
"Happiness is a ball after which we run wherever it rolls, and we push it with our feet when it stops"
"He only earns his freedom and his life Who takes them every day by storm"
"If you start to think of your physical and moral condition, you usually find that you are sick"
"If your treat an individual... as if he were what he ought to be and could be, he will become what he ought to be and could be"
"The people who are absent are the ideal; those who are present seem to be quite commonplace"
"There is a courtesy of the heart; it is allied to love. From its springs the purest courtesy in the outward behavior"
"Trust yourself, then you will know how to live"
"We are never further from what we wish than when we believe that we have what we wished for"
"Where is the man who has the strength to be true, and to show himself as he is?" "Magic is believing in yourself, if you can do that, you can make anything happen"
"Man is made by his belief. As he believes, so he is"
"Many people take no care of their money till they come nearly to the end of it, and others do just the same with their time"
"Mastery passes often for egotism"
"Men show their character in nothing more clearly than what they think laughable"
"Music is either sacred or secular. The sacred agrees with its dignity, and here has its greatest effect on life, an effect that remains the same through all ages and epochs. Secular music should be cheerful throughout"
"Mysteries are not necessarily miracles"
"Nature knows no pause in progress and development, and attaches her curse on all inaction"
"No one has ever learned fully to know themselves"
"One can be instructed in society, one is inspired only in solitude"
"One cannot develop taste from what is of average quality but only from the very best"